This dropped through the letterbox a couple of days ago, and I've now watched it twice. Beautifully shot, packed with big fish, and you really feel you are there with the guys - the agony of hook pulls, and triumph when the fish slides over the net. And some of the conditions they fish in made me feel cold just watching it - and reassured me that there are other people out there who are as mad as me! Inspirational stuff... For an angler that is trapped at work through the daylight hours (and well into the night). Big push at work this week and then hopefully a trip or two to Penton Hook in search of things with teeth! 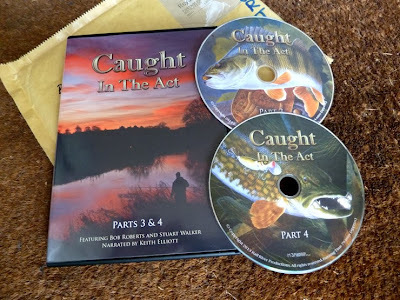 You can get a copy from Bob Roberts website, here. Bargain! [several!] cans of beer (or is it soda?). for the guys of "Caught in the Act". Thanks - Details I didn't know I was including! I like the way Jack is completely oblivious to the conversation, just glued to the TV - Another detail I spotted after it was drawn..! Hi Brian, just found your blog. Are still cycling to your fishing spots ? Another nutter who cycles to fish! Hi Ian, I cycle to Penton Hook - it's the only way to get there without a taxi... If there's a way to get to a spot without a bike I take it - not the biggest cycling fan!